Climate risk insurance can help protect individuals, small businesses or entire countries from permanent damage caused by the impact of extreme weather events. In the short-term it can reduce the effect of natural disasters and, in the longer term, can contribute to preventive disaster risk reduction. But climate risk insurance does not only have economic advantages. It is also a political tool that allows countries which are affected by climate change to become more independent; rather than waiting for months, or even longer for international aid to arrive, they are able to manage disaster risk themselves. Solutions to protect poor and vulnerable people from extreme weather events must always be tailored to local needs and conditions, both in terms of the types of climatic risks a region or community might face, as well as to the needs and economic abilities of potential clients. The same applies for climate risk insurance: Localized assessments are imperative in order to understand the needs of vulnerable communities and identify how they can be best prepared in the event of a shock like a natural disaster. Climate risk insurance is no stand-alone solution: It must also always be closely linked with preventive risk management strategies, ensuring losses and damages caused by a natural disaster are kept to a minimum. Affording risk-based premiums remains a major challenge for vulnerable populations. Measures to increase the affordability of products are paramount to the success of insurance schemes. To make insurance affordable, the product can be partly – or fully – subsidized by governments or other donors. Regional risk pools can also protect the poorest and most vulnerable in case of a disasterPayment plans need to be tailored to meet personal and economic circumstances of the client. Those who still struggle to afford a premium might pay for climate risk cover through an insurance for assets (IFA) scheme. Here, they will be awarded a premium in exchange for taking part in disaster risk reduction activities, such as building flood defenses in their own communities. On average, international assistance will only cover about 9% of the total cost of a disaster. In many cases, individual households have to pay for costs of losses and damages themselves, or wait months for government assistance or donor aid. By building on natural players, such as local associations, cooperatives, mutuals or savings and credit groups, insurances have access to established delivery mechanisms, ensuring payouts are timely, well-targeted and will cover more of the damage than traditional donor payments. Quicker payouts reduce the need for households to take out a loan, migrate for work or take a child out of school in order to get back on their feet. Successful climate risk insurance is based on the inclusive and accountable involvement of beneficiaries and other local stakeholders: A transparent insurance that involves communities in the design and implementation, is one that generates trust. Transparency about how money is paid out, collaboration with organizations that have deep roots in the communities, alongside ensuring the participation and inclusion of women, maximises levels of meaningful involvement. Economic, social and ecological sustainability is crucial for ensuring the success of climate risk insurance. Properly designed, schemes can give an incentive for risk reduction by rewarding clients for taking positive action. 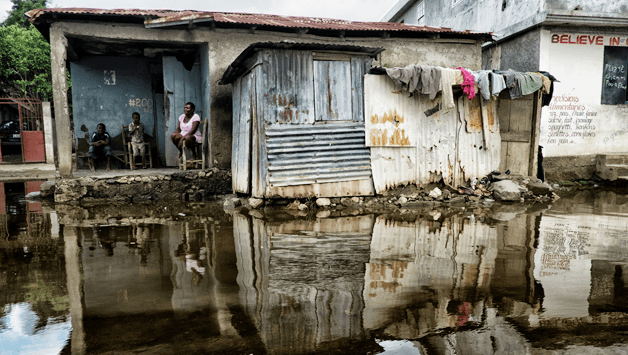 Higher premiums can discourage people from living in areas that are at heightened risk of flooding or landslides, or encourage them to take preventive measures, reducing their levels of vulnerability over the long term. To limit their exposure to disasters, more vulnerable households will often try and avoid taking risks. They might diversify their crops, for example, reducing their levels of susceptibility but also their earning potential. Statistics show that, with the peace of mind that comes with having insurance, households and individuals are more likely to take ‘positive risks’. Farmers might be willing to invest in increasing their grain reserves or the size of their herds, and households might be more confident sending their children to school instead of keeping them at home to work, effectively decreasing child labor and giving them a chance to fulfill their potential.